Hedgehog Diet - What Do Hedgehogs Eat? These prickly little guys require a mixture of protein, fat, carbohydrates, fiber, water, and some vitamins from fruits and vegetables. Protein in the food for your hedgie should be over 20% while fat should be between five and 15%, and a good amount of fiber is also needed for a healthy diet. There is commercially available hedgehog food, but it is not always in stock at some pet stores so a chicken dry cat food which is high in protein is a solid alternative. Dry food should be the primary portion of your hedgie’s diet generally speaking. In their natural habitats, hedgehogs are mainly insectivores, but they often eat whatever is available. 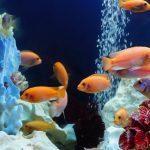 They are known to eat insects, baby mice, frogs, fish, worms, even small snakes, various eggs they can find unprotected, and fruit. They are definitely not picky eaters. 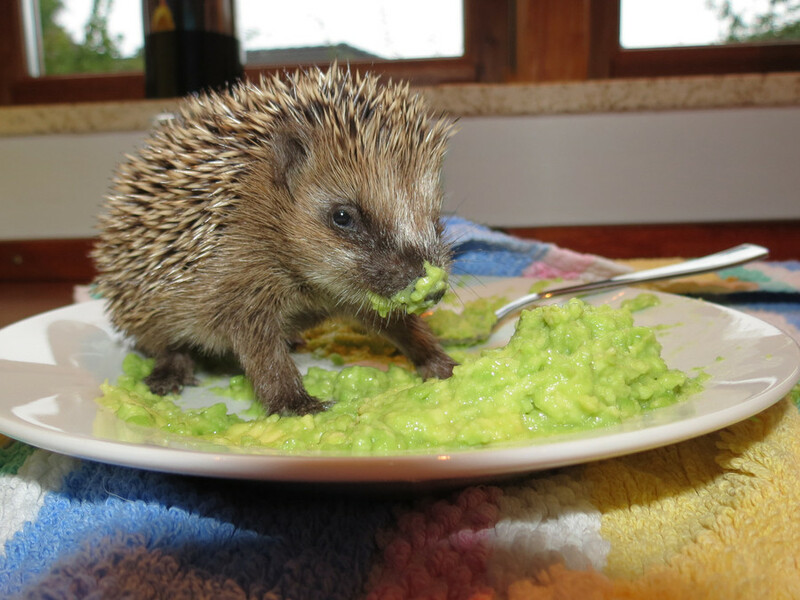 Your pet hedgehog needs a well balanced diet which is high in protein. How much you should feed him depends on how active he is. If you notice your hedgehog becoming obese, you need to decrease his portions. A nutritious, carefully chosen and varied diet will make sure you have a happy and healthy little companion for many years. Hedgehog breeders, enthusiasts, homeowners but also dietary experts recommend and use a wide variety of foods. A varied diet is the safest way to meet a hedgehog’s nutritional needs. Variety in diet can be gained through a blend of dry foods combined with a variety of nutritious treats to supplement their main diet. Giving them a variety of foods will prevent hedgehogs from getting attached to only one food. They could have a serious weight and health problems if their diet is not varied or if you constantly give them the same food and suddenly they refuse to eat anything else. Hedgehogs’ diet should be a healthy mixture of proteins and fat. Meat protein sources should be the top two in the ingredients list. Chicken and lamb are the best quality protein sources for insectivores because they are the most easily digested. Pork and beef are cheaper sources of protein but they are not as easily digested and are not the best choice. Foods that contain several protein sources tend to be more beneficial because they provide a wider variety of amino acids that are the building blocks of all cells. 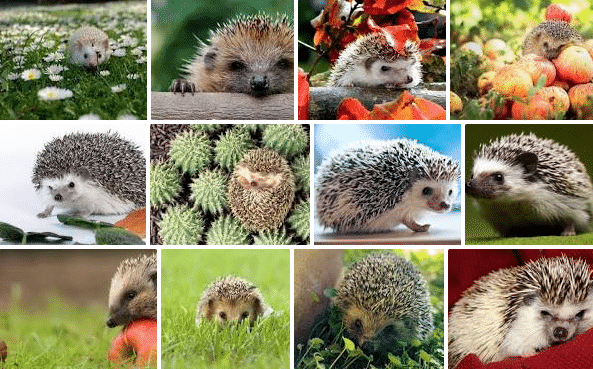 Different protein and fat levels are required during different times of the hedgehog’s growth and development. Nursing moms and growing babies need more protein (30-35%) than grown up hedgehogs. A higher fat content is beneficial for animals that require more calories. Too much fat can lead to obesity and the related health problems. Most people recommend a quality, dry, hedgehog food with at least 20% protein and fiber content with double digits as the staple food. You should also make sure the food has L-carnitine listed as an ingredient. It’s great for heart health and to supplement the diet with just a small amount. In addition, you should offer live insects, cooked chicken, vegetables, and fruits. A very small amount of canned cat food can be offered only as a treat. You should stay away from seeds, raisins, and dried fruits and vegetables as they get stuck in their mouths. If you cannot order your hedgehog’s food online and your local pet store doesn’t stock a quality hedgehog kibble then the next best thing is to feed a holistic or high-quality chicken cat food with a small kibble. You need to bear in mind that this is not the ideal food since there is no blood meal or chitin in it like the hedgehog food contains. So why do so many people feed their hedgies with cat food? 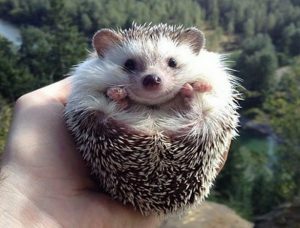 A few decades ago, hedgehog food was not widely available, and then when it finally became available, it wasn’t as quality and nutritious as pet owners people had hoped for. Premium cat food is available to almost everyone, it’s often on sales and there are always coupons so it’s more affordable. It contains protein and is a small kibble that hedgehogs can eat. This is why many people still choose to feed hedgies cat food rather than hedgehog kibble. Another reason is that cat food is small enough kibble that most hedgehogs can chew. Hedgehogs’ owners who have only had experience with the early days of hedgehog food, or low-quality brands feed a very high protein brand of cat food instead. The protein source doesn’t bother them and the fiber in the diet replaces the chitin component. They can also easily get a high protein cat food from their local supermarket, grocery or pet store instead of having to order a good hedgehog food online or drive to a specialized pet store miles away. No, they don’t. Do not give them bread because they cannot digest it. Contrary to popular belief that hedgehogs will benefit from a bowl of bread and milk that people usually put out, they will not. They will eat it, of course, and they seem to enjoy it, but they cannot digest bread, it upsets their tummy and milk gives them diarrhea. Hedgehogs in your garden mainly eat beetles and caterpillars, not slugs and snails. Slugs can be occasional addition but not the main source of protein. Only about 5% of their diet naturally will be slugs or snails and hedgies will only eat a lot of slugs and snails when they are starving and no other food is available. Slugs and snails are the main carriers for the lungworm which is a killer of hedgehogs: when lungworms breed inside a hedgehog they multiply quickly and fill the hedgehog’s lungs. Poor creatures will then either die of Pneumonia or bleed from the lungs. 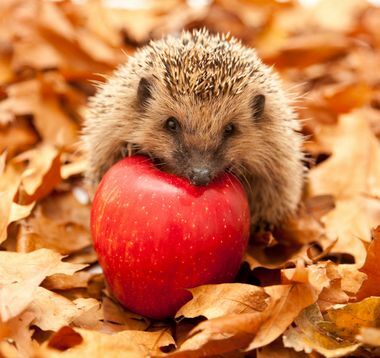 What Fruits Do Hedgehogs eat? Fried foods are not good for your spiny pet because the grease can upset their stomach and the excess calories are bad good for hedgehogs as they can cause obesity. Hedgehogs are mostly lactose intolerant so milk should be avoided as it upsets their stomach and gives them diarrhea. Dairy products such as yogurt and cottage cheese can be given in very small amounts, if any, as they can cause intestinal upset, too. Hard foods such as peanuts, almonds, and raw carrots are choking hazards. Great caution as regards the size of chunks is advisable. 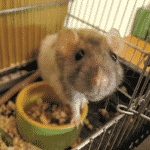 Sunflower seeds, peanuts, or other seeds and nuts are best left for rodents and birds. Hedgehogs do not have a beak, nor a specialized tongue and they cannot use of their front paws to help them crack and eat the meat of sunflower seed. Once again, seeds and nuts are serious choking hazards. Sweet foods which contain refined or processed sugars are not a good treat for your pet. We suggest that you completely avoid them. Sticky foods such as raisins or other dried fruit are also a bad idea since they can stick to the roof of the hedgehog’s mouth or to its teeth and cause discomfort and tooth decay. Fibrous or stringy foods such as celery are hard for hedgies to chew and digest. 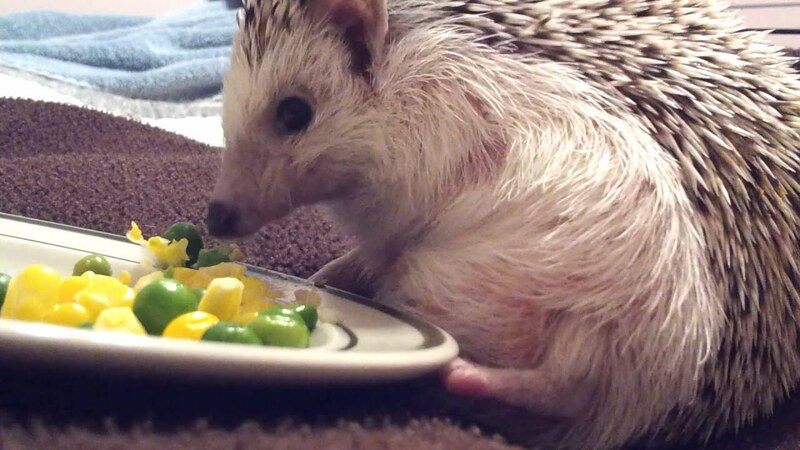 Spicy and foods such as onions and garlic may also be upsetting to your hedgehog’s stomach. Raw eggs or meat should be completely avoided because of the risk of Salmonella. Foods causing debates in the pet industry include grapes with seeds and avocados. Salty foods such as canned meats and vegetables can not only upset your hedgehog’s stomach but also cause electrolyte imbalance as well. So, look after your hedgies diet and you will have a healthy and active cute little pet for years to come!